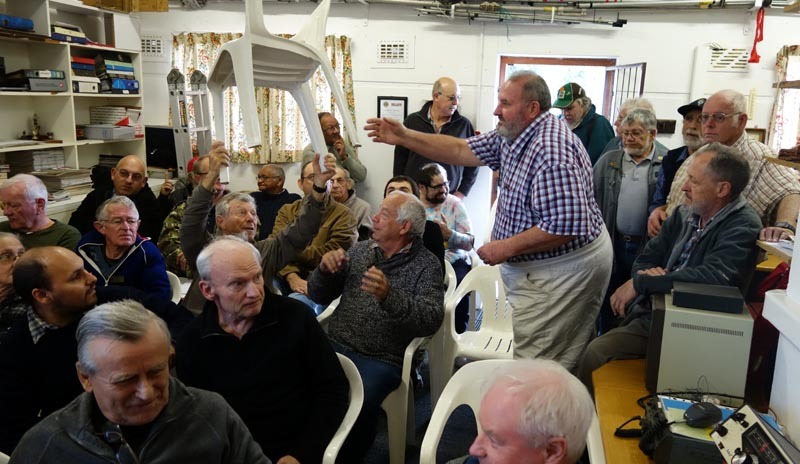 Here is a polite request from the CTARC Committee for all trophy winners from the 2016 AGM to please return their trophies to the CTARC Clubhouse no later than the June meeting (Saturday 24 June 2017 at 14h00). We need to prepare these trophies for the new recipients in time for the July 2017 AGM. In some cases this involves engraving the new recipients name timeously. Nomination forms will be e-mailed to CTARC members presently, so that worthy recipients of the awards may be selected. The June 2017 monthly meeting for the Cape Town Amateur Radio Centre will take place at the clubhouse in Rondebosch on Saturday, 24 June 2017 at 14h00 local time. 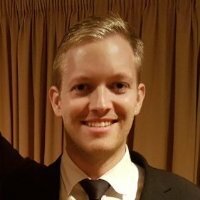 At this meeting, Stephen Paine, an Electrical Engineering PhD student at the University of Cape Town, will give a talk and presentation on Passive Radar Systems, with which he is involved. It promises to be a most interesting event. 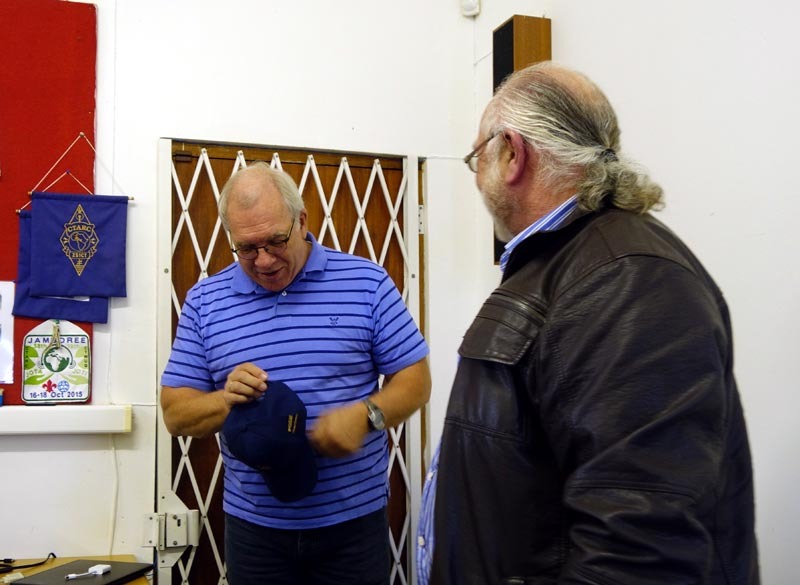 After the meeting there will the chance to chat and ask questions over coffee and biscuits, and to peruse the Swop Shop table for bits and pieces of amateur radio gear. All are welcome to attend. Looking forward to seeing you there! The Cape Town Amateur Radio Centre held its May 2017 meeting at 14h00 B: at the usual clubhouse venue in Rondebosch. 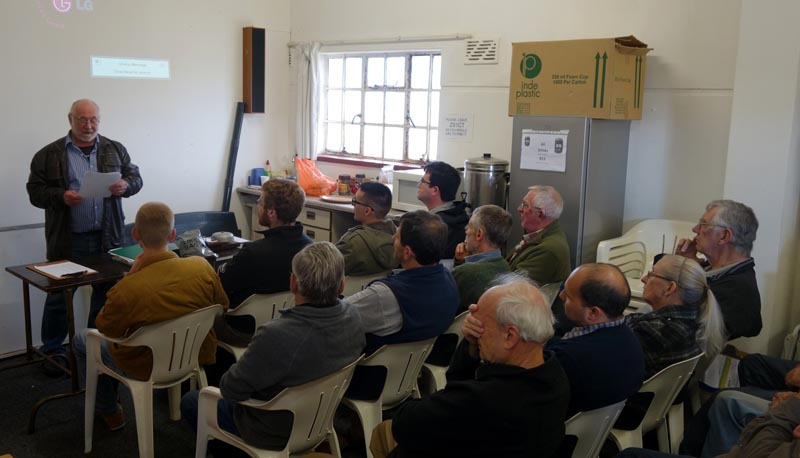 Our meeting room was gratifyingly packed for the event – standing room only at the back – in spite of the rather chilly and overcast weather. It was also very gratifying to see new members (and young faces) at our club, which appears to be growing with each successive meeting. Rob /ZS1SA opened the meeting and welcomed all there. He then gave a report back on the recent committee meeting held on Monday 22nd. Among the details he mentioned are the new black-out curtains for the clubhouse video projector, kindly made up and donated by Anne. Charles / ZS1CJO suggested we start a WhatsUp group for club members, and so those wishing to be included in this listing please e-mail our secretary, Anne, at zs1ct@ctarc.org.za with your name and call sign. 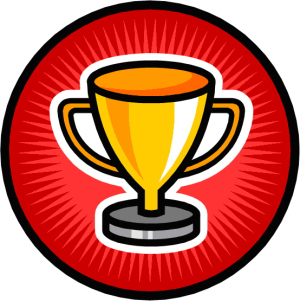 Rob also requested those club members who received club trophies at the 2016 AGM to please return them at the June meeting on Saturday June 24 (no later, please!) so that we can prepare them for the new recipients. Rob also mentioned we will send out Club Award Nomination Forms so that worthy award recipients may be nominated. 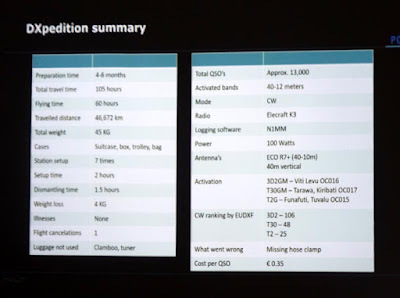 The patchy performance of late of the 145.750 MHz repeater on Tygerberg was also mentioned. This repeater has been adversely affected with an intermittent fault cause, we believe, by a recent (and rare!) lightning storm in Cape Town. The club is looking into the repair of same. New members were also welcomed into our club. Their details will be updated in due course. Then it was time to introduce our guest speaker, Gerben Menting / P5GM, to our anticipatory audience. 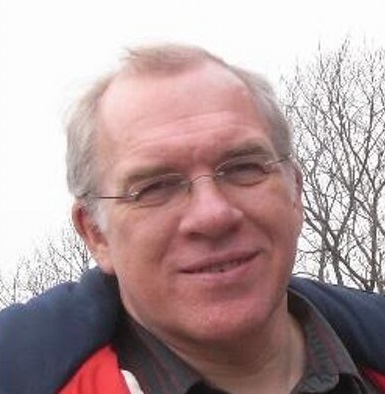 Gerben hails from the Netherlands, and is a serious DXer who has been involved in some significant DX-peditions across the world. His DXpedition philosophy is sensibly practical: he finds a balance between good international ham demand for the DX-Entity, the feasibility of access to the remote location, and there being a reasonable chance to obtain a legal ham radio operator’s license. 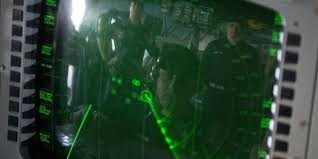 So he selects locations to which travel is relatively accessible, selects suitable accommodation (preferably close to the shoreline) with reliable mains power and with permission to erect an antenna. In addition to this, Gerben takes an interest in the geographical and cultural features of his destinations and brings his XYL along when circumstances permit. He has found in the past that it is practical to operate solo, which requires the minimum of equipment (100W, operating CW) and accommodation, keeping the costs suitably low. In comparison, certain major DX-peditions, while admirable in the scale and scope of their achievements, also come with formidable budgets and sponsorship requirements, way beyond the scope of the individual. 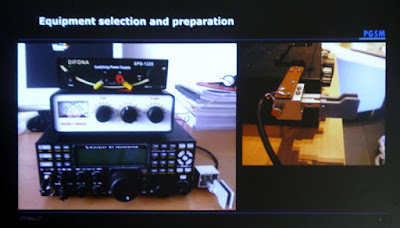 Gerben’s preparations involve careful selection of equipment (usually an Elecraft K3 transceiver) and antennas (an R7 trapped vertical and a collapsible 15m fibreglass pole) and paring down the weight as much as possible, with the aim of a maximum portage weight of 45 kg. This load –the rig, mast, antenna (and a spare emergency dipole) , personal clothing, is all carried just by himself. To keep the weight manageable, no second rig, power supply or laptop is brought along. All licenses and permissions are applied for far in advance. Networking is done with other DXpeditioneers to find the “lie of the land” and much use is made of Google Earth to ascertain suitability (i.e. proximity to coastline, 3-dimensional topology) of his prospective operating venues. Gerben gave us details of two recent DXpeditions – the first one to Fiji (as 3G2GM) , Tuvalu (as T2G) and Kiribati on Tarawa Island (as T30GM), and the second one to Macau on Coloane Island (as XX9TGM). 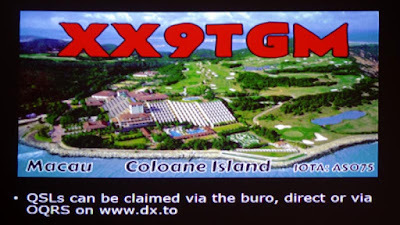 The first DXpedition was into the southern Pacific. 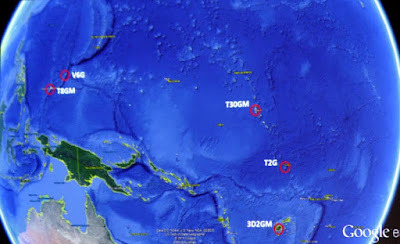 In all three locations he managed to get the antenna up close to the waters edge, favouring a good take-off angle to Europe and the USA (the Japanese stations are ubiquitous, as can be expected in the Pacific). Tuvalu, being no more than 2m above the shore, has its own serious issues with the rising sea levels. The only drinkable fresh water is rainwater, and no vegetables can be grown on account of what little land there is left having been swamped at times by high storms. At his location he was never further than 150 metres from the sea. It was on Tuvalu that he discovered how difficult raising a 15m height fibreglass pole with an R7 on top can be when attempted on one’s own!. But he managed by way of some intermediate guy ropes. 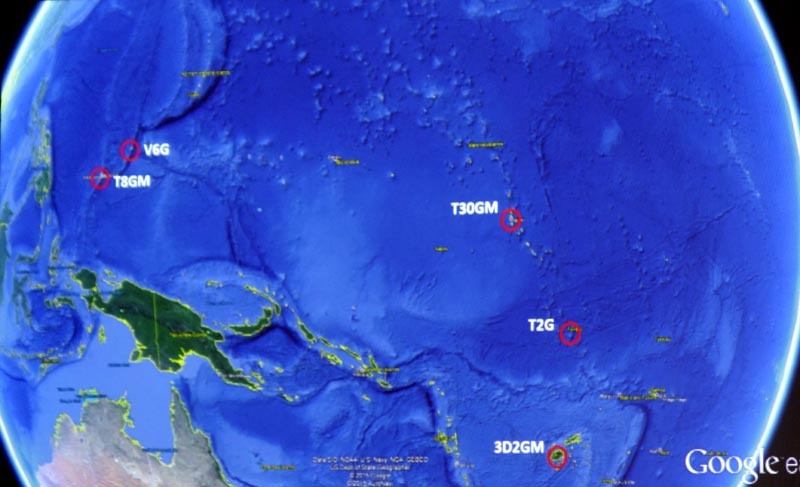 This close proximity to salt water, while providing ideal antenna locations, also brings the curse of rust and corrosion, which is pervasive across many small pacific islands. Tuvalu is famous for its postage stamps, and Gerben managed to visit their fine philately department. On his departure, the aircraft was delayed for a further two days so he went back to his operating position, re-erected his antenna and got in some more highly productive operating time. Gerben then showed us a presentation of his Macau trip. 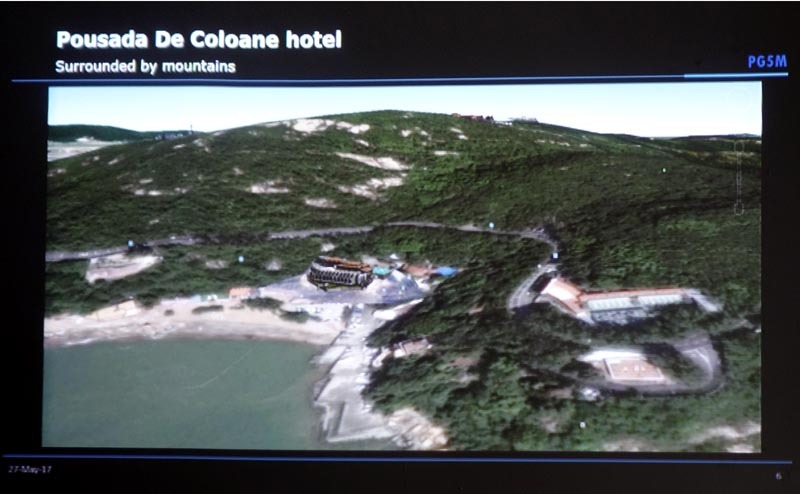 Coloane Island is basically an island of casinos, and the problem is one of finding suitable operating venues. 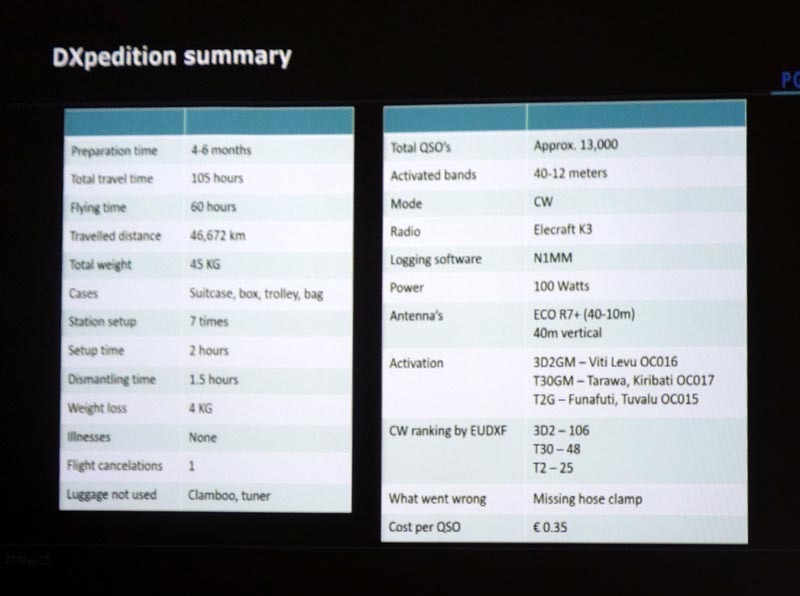 A previous DXpedition on the north of the island had proven unsatisfactory because the venue proved to be very (RF) noisy and is surrounded by mountains. After some deliberation, Gerben selected a hotel on the south of the island, on account of the good take off its location offered towards Europe and the USA. He positioned himself in an apartment on the top floor of the hotel and was ably assisted by a technical assistant of the hotel, who kindly welded a steel base place and cylinder for him to mount the base of the antenna in!. The mast raised above the hotel roof. This choice of location proved to be worthwhile, owing to the amount of contacts made during his stay. 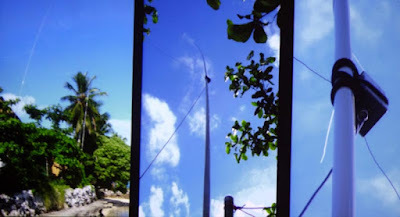 A later DXpedition to this island confirmed Gerben’s good initial site selection, as they then hired the top row of apartments in that hotel, were able to mount a series of antennas on the roof, and harvested an equally satisfying number of contacts. At the end of Gerben’s talk, the floor was opened to questions, which he kindly answered to all our satisfaction. 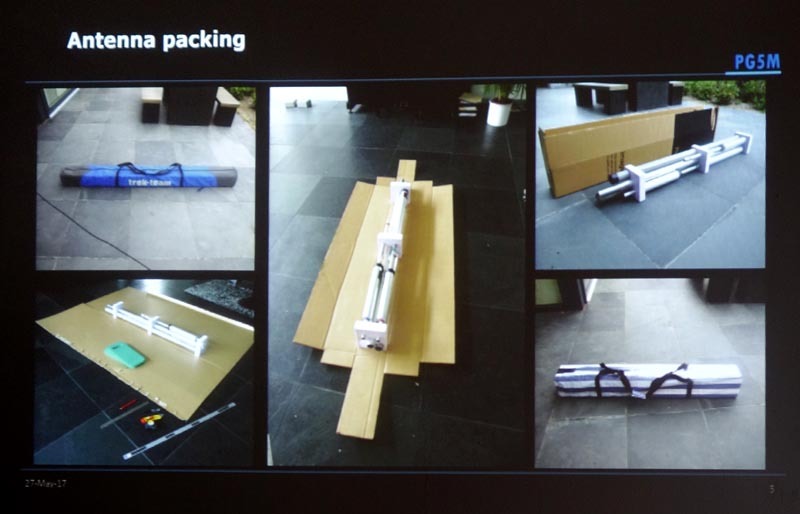 We were all inspired by Gerben’s fine presentation, which shows that DX-peditioning in far-flung places can indeed be achieved by an individual with limited holiday time and on a tight budget. After Gerben’s fine presentation, Rob thanked him on behalf of the club and presented him with a personalised CTARC club cap, to the applause of the club. Thereafter it was time for coffee, biscuits and eyeball QSO’s. At this point, Kassie / ZR1JK brought in (literally) buckets and boxes full of electronic components to be distributed to those who could use them. Grateful members helped themselves, and the remnant components have been donated to the CT Radar group for further use. 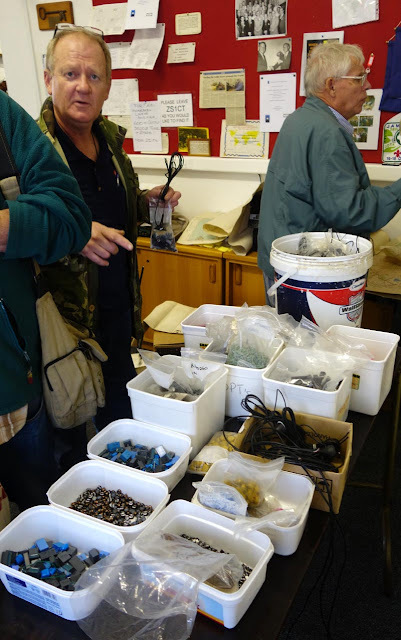 Mike / ZS1FP, Ian / ZS1SX, Paul / ZS1S and others also brought along various bits and pieces to trade. Daniel / ZS1DEA brought along an interesting antenna which he would like to identify and find the resonant frequency of. 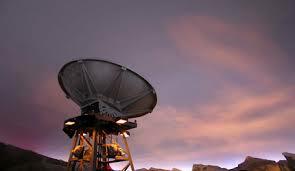 We will do some tests on it with an antenna analyser presently. It looks like a J-pole, but it also has three radials at the bottom. The height of the main vertical element (from what looks like a loading coil at the base, to the top) is 1.69 m. If anyone recognises what that antenna is designed for, do please let us know. 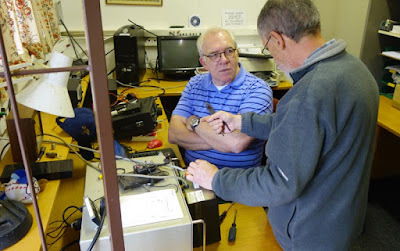 Gerben and Paul / ZS1S stayed on at the clubhouse afterwards, for Gerben to get the chance to do some CW operation. Once again, a satisfying afternoon was had by all. Many thanks to Gerben for his well-presented and fascinating talk. 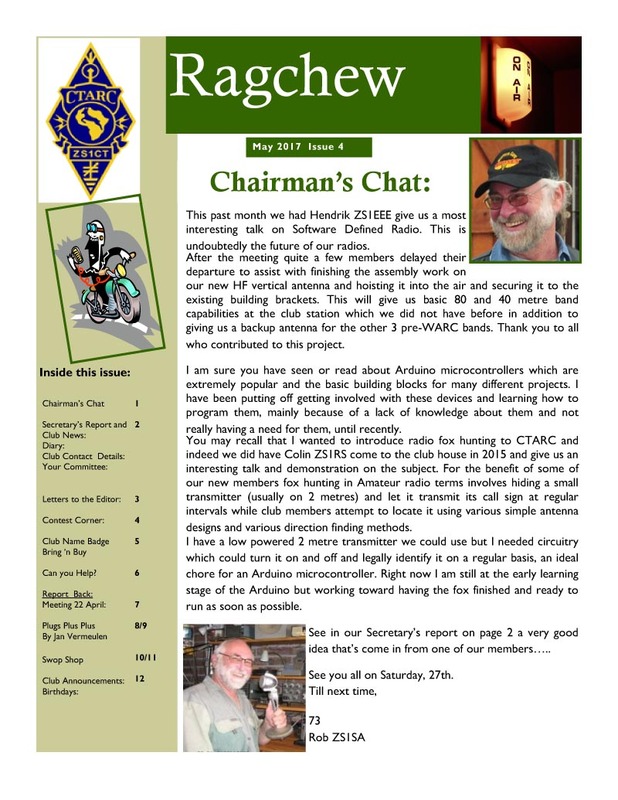 We look forward to seeing you all at the CTARC's June meeting next month. 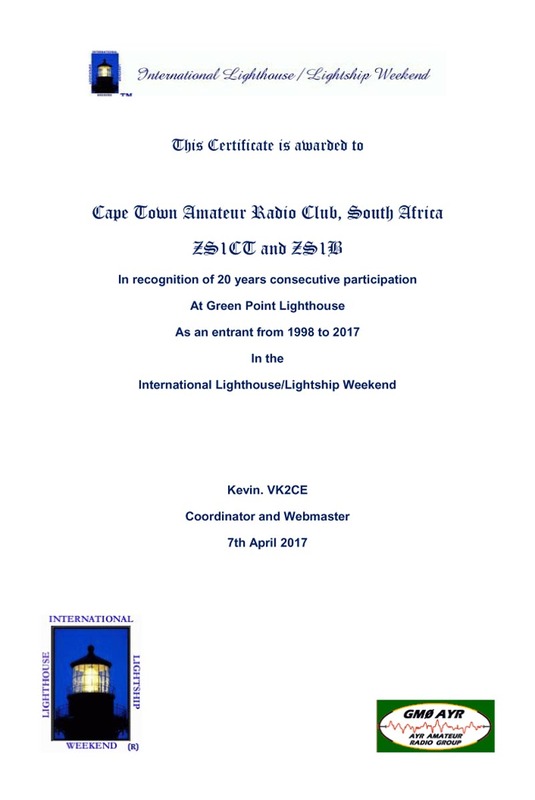 Recently the Cape Town Amateur Radio Centre received a certificate from Kevin /VK2CE, the webmaster and coordinator of the International Lighthouse/Lightship Weekend, congratulating our club for twenty years of continuous participation in the event, from 1998 to 2017. In fact, the CTARC was the first South African amateur radio club to take part in the event, way back in 1998 (you will note that the certificate refers to the former ZS1B / Bud Voortman, now SK. Bud was a moving spirit in the CTARC's involvement in the ILLW). 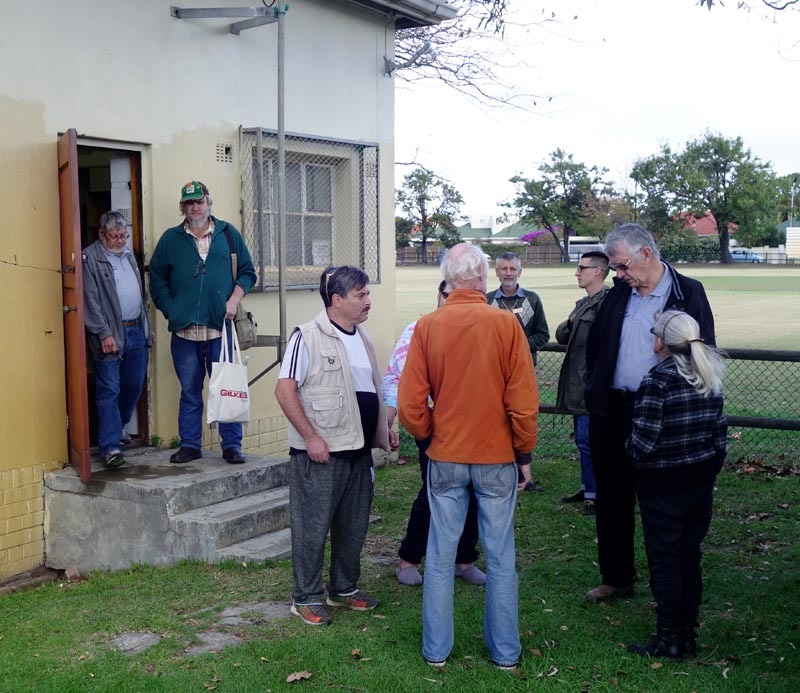 The CTARC will take part in ILLW again at Green Point Lighthouse, on the weekend of 19/20 August this year. 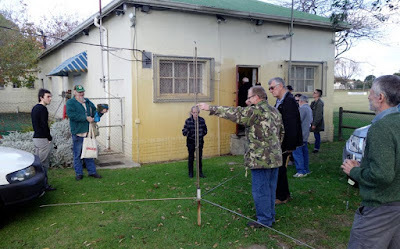 It's a great event with the opportunity to show the flag for Amateur Radio and to work local and DX stations. Further information will be published here and announced on our bulletins closer to the time. 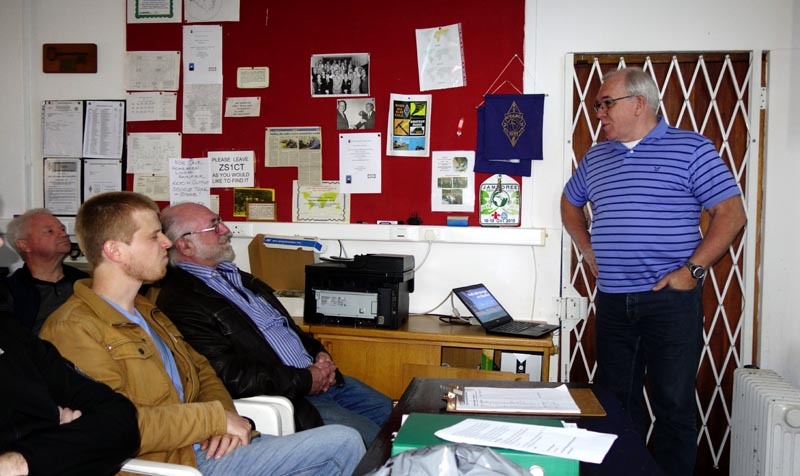 The Cape Town Amateur Radio Centre holds its monthly meeting for May at 14h00 on Saturday 27 May 2017. Details of the clubhouse venue are [here]. At the meeting, Gerben /PG5M, a very experienced DX-er from the Netherlands, will address members on his wide-ranging experiences of DX-peditions. It promises to be a most interesting talk. We look forward to the pleasure of your company. See you there. The May 2017 edition of the Cape Town Amateur Radio Centre's bi-monthly newsletter "Ragchew" is now published. Grateful thanks once again to Anne for another fine edition!